The Alma collection by Jennifer Taylor Home is the perfect addition to any living space looking to add a bit of a modern flair. The fabric selected for the collection features a polyester blend and engineered for long life. Our wood frames are made from kiln dried birch wood which provides exceptional support and stability. Crafted beautifully accented with flared arms, hand tufts along the seat, matching decorative cord outlines, and matching 2 bolster pillows, this bench brings class and lounging comfort to any room in the home, whether it’s used as additional seating for guests or extra space to spruce up your home decor. 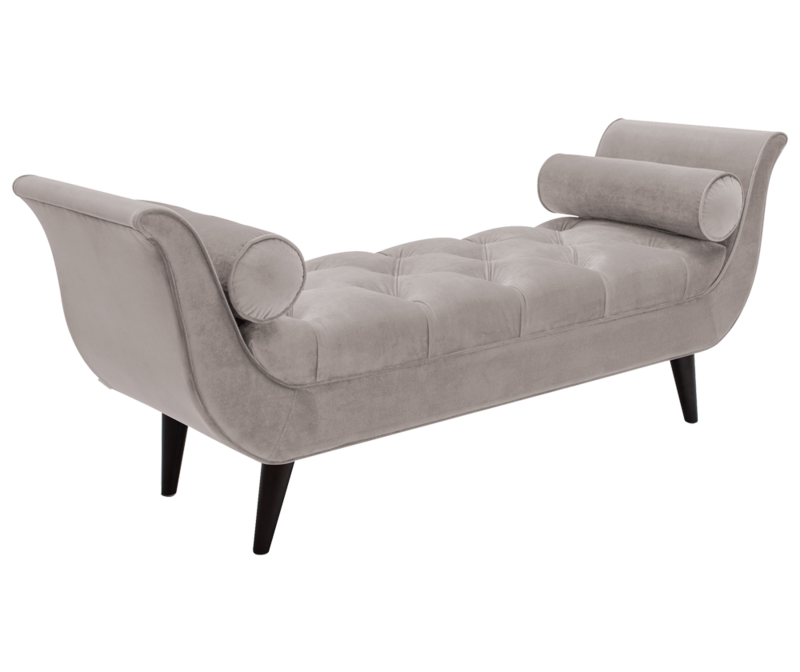 The Alma is a glamorous bench that will be the perfect addition to your home décor. Made beautifully, this bench is built from kiln dried birch wood engineered to last a lifetime. The Alma is the eye-catching bench you were just looking for. 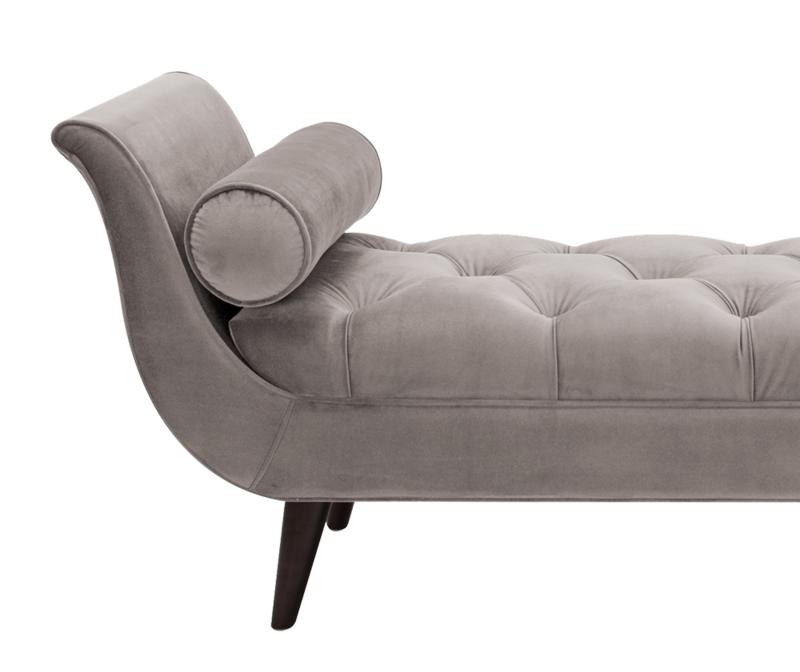 This bench is accented with flared arms, hand tufts along the seat, matching decorative cord outlines, and two matching bolster pillows. The Alma is made from premium woven polyester wrapped around high-density flame-retardant foam padding and cushions for a medium firm feel. Comes in a variety of ten colors to choose from. The size and proportion are perfect. This has the art nouveau style that I love. Love the color I chose as well! I am a designer and invited a very high end designer friend over to see it. She thought it looked very expensive. WIN WIN all around!! I love my new bench! I put it in front of our bed. I love the teal color. Its very stylish! The color is amazing and just what we were looking for (we got blue). This bench was a breeze to put together. Sturdy for our use in the office. The kids love to use this for their reading spot. I love this ottoman. The shape gives it added elegance. The nail head accents are attractive and don't take away from the glamorous feel of the piece. The color isn't quite burgundy, but rather tends a little to a wine color. I would buy this again. Looks great at the end of our King Size bed. We bought the same colour bed from another collection and complements it. Well built. Also the round pillows are removable (not attached to the bench) and noticed a nicely concealed zipper on the bottom probably for cleaning when and if needed. The raised sides are perfectly aligned with the bottom of a king size bed. Great product. Looks nice in my bedroom .